Deputy Prime Minister and Minister for Foreign Affairs Krishna Bahadur Mahara has said that problems of Nepali migrant workers will be addressed by improving the inter-ministerial coordination. Speaking at a meeting of the Parliament’s International Relations and Labour Committee on Thursday, DPM Mahara said the ongoing crisis would be resolved with a simultaneous mobilisation of state bodies and diplomatic missions abroad. After discussing the issues related to foreign employment with ministers for foreign affairs, home, and labour and employment, the House committee directed the government to call back heads of the diplomatic missions in the Gulf nations and Malaysia to discuss about the condition of Nepali workers there. It also asked the concerned ministries to implement the previous decisions. Addressing the concerns of the committee, Mahara said that he had been in regular consultations with the Ministry of Labour and Employment over resolving the present crisis. He assured the committee that the concerns of migrant workers would be resolved, saying that a mechanism was formed with representatives from ministries of Foreign Affairs, Home and Finance. 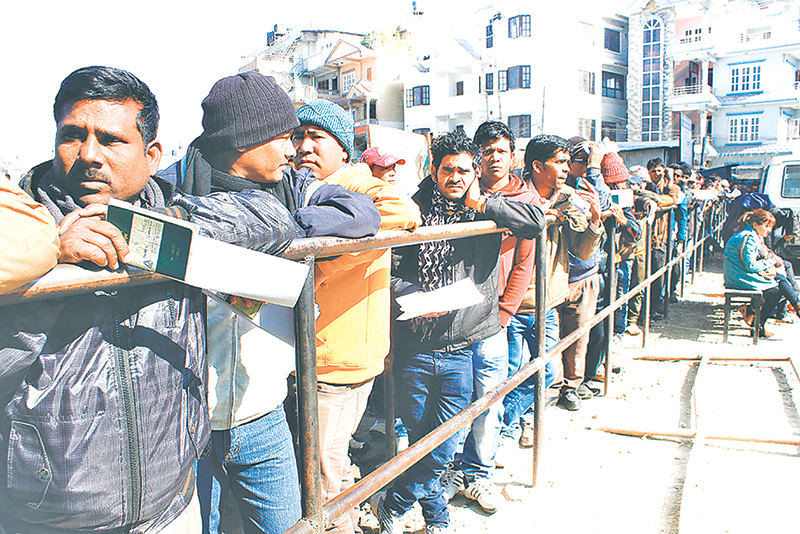 Stressing the need to resolve the problems facing Nepali migrant workers in the Middle East with special care, Mahara said the government was thinking of finding a way around the ongoing standoff in the region by increasing coordination and organising a seminar among diplomatic missions and labour attachés. Reiterating commitment to making the foreign employment sector well-managed and secure, the DPM said the government would be working on forging stronger ties with the host countries and that Nepali workers would be sent only after having labour agreement at the government level. For now, the ongoing situation will be eased by forming a bilateral consultation mechanism, Mahara said. solution,” he said, adding that the labour desk at the diplomatic missions would be made effective. workers in the country in the long run. Secretary at the Foreign Ministry Shanker Das Bairagi stressed on making amendment to the existing Foreign Employment Act, suggesting stringent action against the recruiting agencies involved in cheating migrant workers. “Security of Nepali citizens is the government’s responsibility. For this, coordination among government bodies is crucial,” added Bairagi. Meanwhile, the committee has directed the government to get an integrated software that would keep records of migrant workers and ensure their security as well as facilitate in rescue missions.